Buying an old piano is an exciting adventure for any musician. Paying for someone to re-polish your piano can be expensive, so having a go yourself will save you several hundred pounds. For a professional re- French Polishing service, like it was in the showroom, can cost in excess of £6,000. This tutorial is a guide only, and will hopefully help you every step of the way to achieve good results - but be warned, it's not plain sailing, and you will need to dedicate a lot of time for this project. Your finished product will also depend on the quality of the materials you choose, so I have shown also some of the more expensive products I use to give you good results. For this guide, I will refer mainly to the "upright piano" - some references to grand pianos - not a specific piano brand, but some that have been previously French polished, and generally looking tired with scratches and few dents and bruises. You are also recommended to practise on any spare piece of wood, preferably with old French polish on it, and see the results yourself. The "key" to success is good preparation. 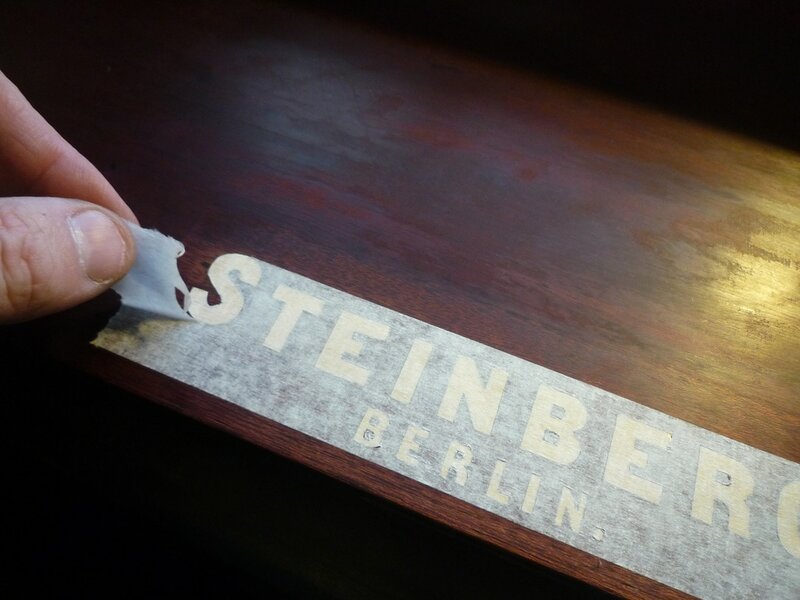 Remove as much of the piano cabinet panels as possible; label all screws and write say "screw A" on some masking tape wrapped around the screw, then write the letter "A" next to the screw hole. Use various different containers or envelopes to put multi screws in - e.g. fallboard screws, labelling each container. TIP: Bank draft deposit envelopes are useful. Remove all brass hinges, lock plate, escutcheon and any other fittings or fixtures. If your piano has various front mouldings with trims, take care removing these as there may be panel pins involved. 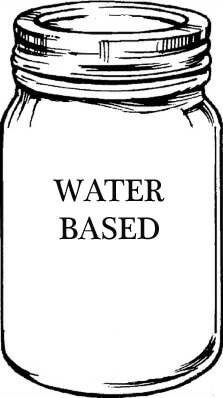 Make sure that you label everything as clearly as possible whatever is removed. Certain parts only go back one way. It is not essential to remove the action, but may be best, if it is safe to do so. If in doubt, cover it with paper & masking tape. You MUST remove the piano keys, so number them from 1 - 85/88 again, and remove all the keys. Store in a box. 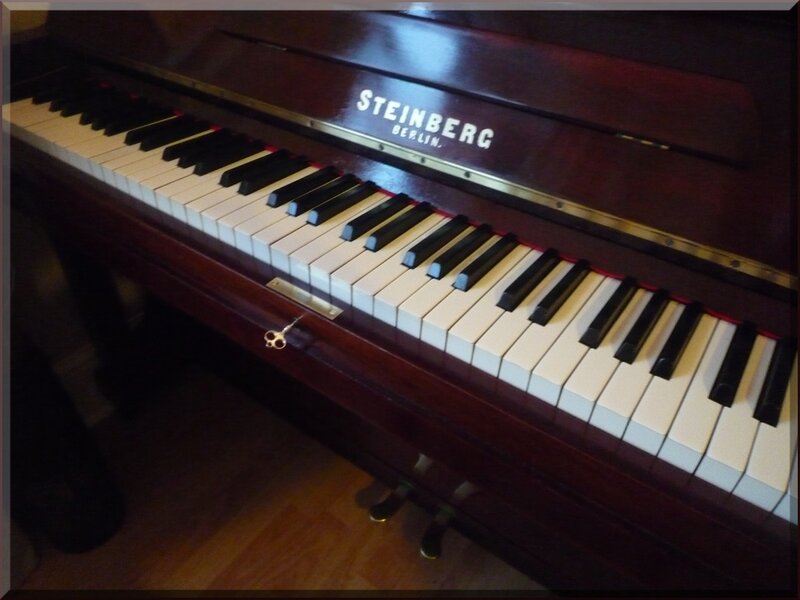 Note: On some pianos, the centre chasing holes may swell after removal, so you will need to contact a piano tuner after the work if most of the keys are sticking down. If you are not sure how to remove the pedals, just put masking tape around them, including the rebate felts. Removal of the key bed (as seen above) requires a professional to do this unless you have lifting/ tipping apparatus. Please read everything first before you attempt any stages, as there optional extras along the way. Working on a small area, apply chemical stripper to the old polish with an old paint brush - dabbing it on quite thickly. For the average upright piano, you will need about 1.5 litres of stripper, so best to buy a 2 litre tin. After about 5 minutes, when blistered, remove the old polish with a scraper. Re-apply the stripper and repeat process if required for subborn areas. Make sure the room is well ventilated, and children/ pets are not present. 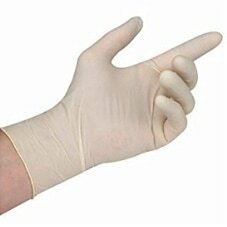 Use rubber gloves for applying stripper. Gloves may be removed when the stripper has reacted and "gone off"
The image above showing the stripper & polish gone off, and being safely disposed of in a plastic container. 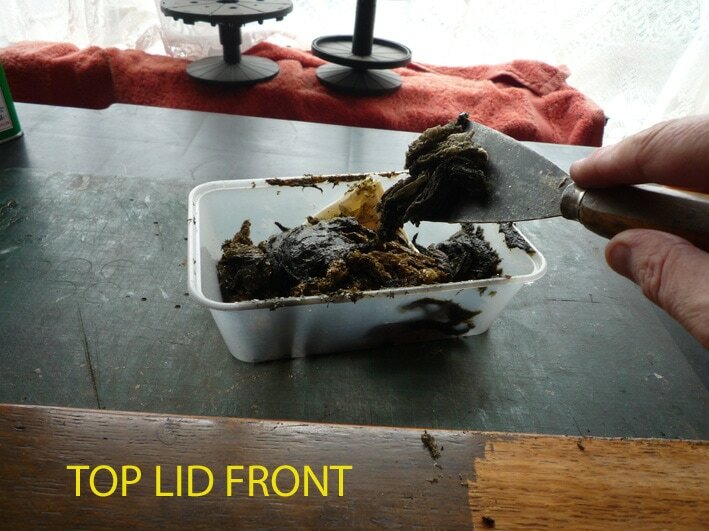 Showing the first stages of polish removal in a small square area of top lid. Work the scraper back & forth to remove the polish. If the polish is darker than the rest (i.e. not exposed to light), this may require additional work. Use a blunt wallpaper scraper for this first stage, to generally remove the polish in one go. Note: Most French polishes have a staining agent built in, this should be removed. Using a sharp scraper (like one to remove decals), work it back & forth to remove any stripper/ old polish from within the grain of the wood. Be careful not to scratch or damage the wood. Always wipe the blade clean after each swipe. 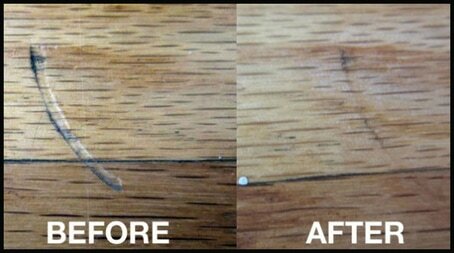 It is very important that you remove all traces of the old polish, often left behind by the scraper. Small dark areas like this would definitely react and blister with new polish, so using a RAZOR SHARP knife blade (removed from the knife), in great detail, scrape these areas away, then generally "swipe" the wood to give it a clean and smooth finish. When complete, clean with methylated spirits using a cotton cloth, then dry off using 400 sand paper - wet & dry is best (used dry). Dark areas are more common where there are recesses in the wood. Removing old polish & stripper from edges (no stripper). This is the fallboard from a 1920s Chappell upright piano. It is sometimes easier and quicker to remove polish from end sections of wood using a sharp knife as a scraper, directly onto the polish. 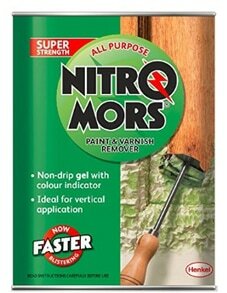 This also reduces the risk of any chemicals seeping into screw holes and hinge rebates. 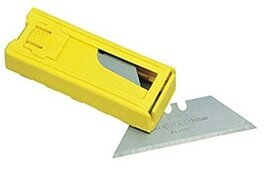 Also working on the "corners" of all sections is easier with a blade. 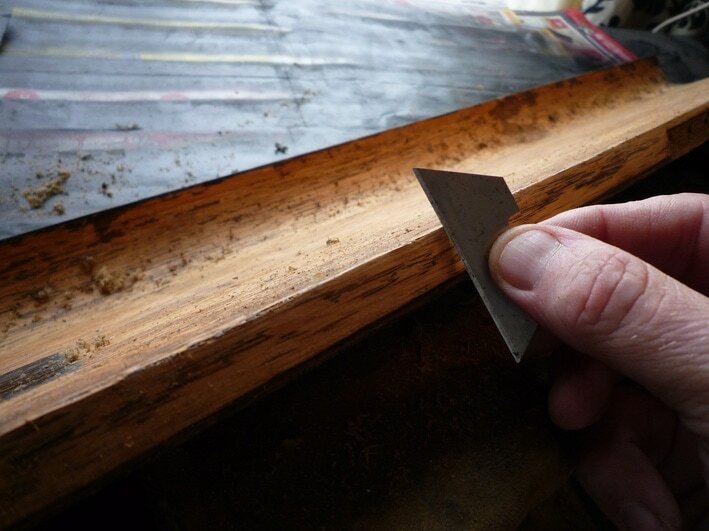 If the wood slightly splinters, use sand paper to smooth off edges. I cannot emphasise enough the need for good prep work. 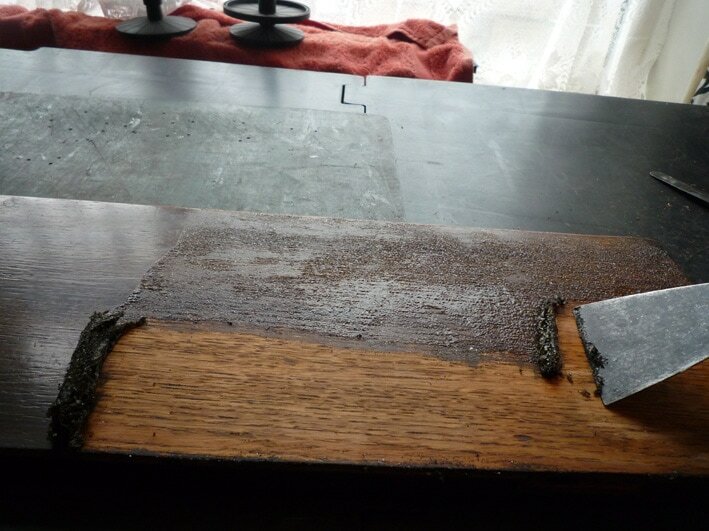 Always use clean tools & equipment, and regularly change sand papers and cloths. Do not keep re-using them. Keep your worktop clean at all times by regularly using a vacuum cleaner & wipe down all surfaces. Small scratches, dents, bruise marks, missing veneer etc. (not shown) - black permanent marker pen & masking tape / palette knife / cigarette lighter or Bunsen burner. 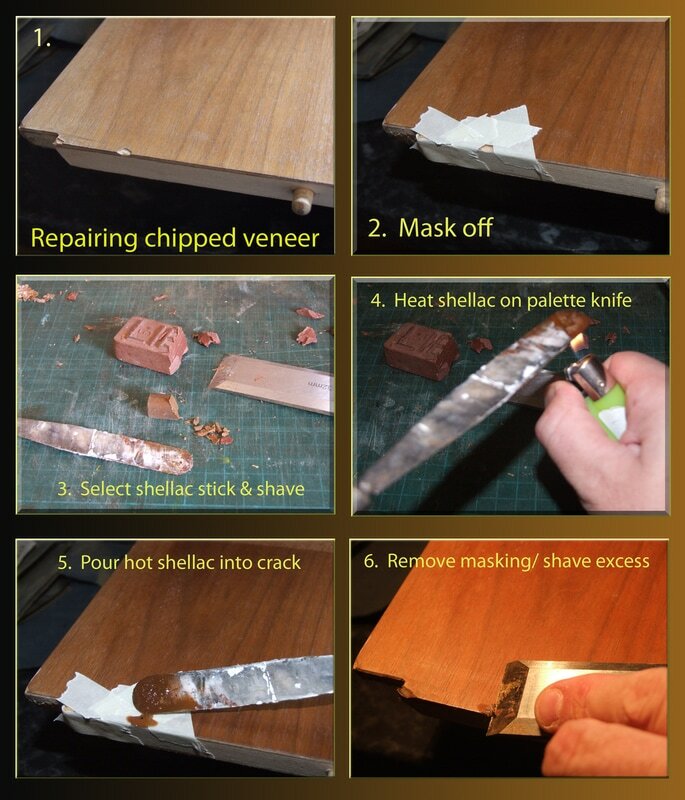 Depending on the repairs, these images (left) demonstrate how to use a shellac stick for corner/ edge repairs to some missing or chipped veneer. For general scratches and small dents in the wood, "draw" the shellac stick over each scratch until it is filled in like using a crayon. 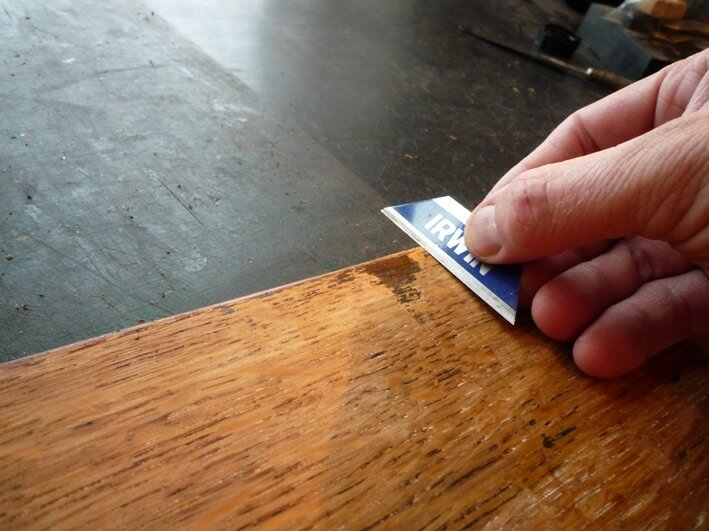 Then wipe off excess with a sharp blade and clean the wood. If the wood finish is not veneered, but instead, photo grained, you may be able to skip stage 1 if French polish has not been used. Most wood finishes have a carcass wood underneath like timber. For the next stage if photo grained, sand all the wood and clean to give the surface a good "key" for the new polish to be applied. If there are any carcass wood bits showing, use a black marker pen to colour them in. For an ebonised wood finish, the colour of the shellac stick is not important - but don't use wood or car panel fillers. Shellac sticks are similar to crayons, but they have a property inside them that do not react with French polish. Now prep all your wood and clean down with TACK CLOTH to remove dust particles in the air. 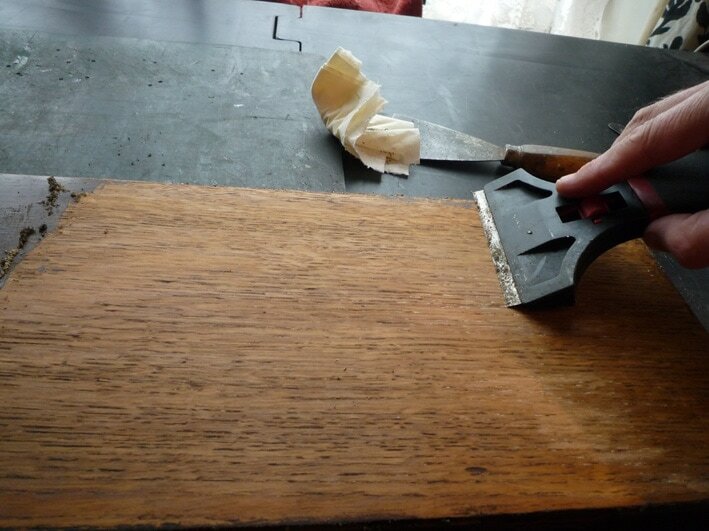 After using tack cloth, the wood surface is now ready for the first French polish - do not wipe again with a normal cloth. Do not use any primer / undercoat paint of any description as this will ruin your work so far. Cover up with dusts sheets any panels awaiting to be polished. 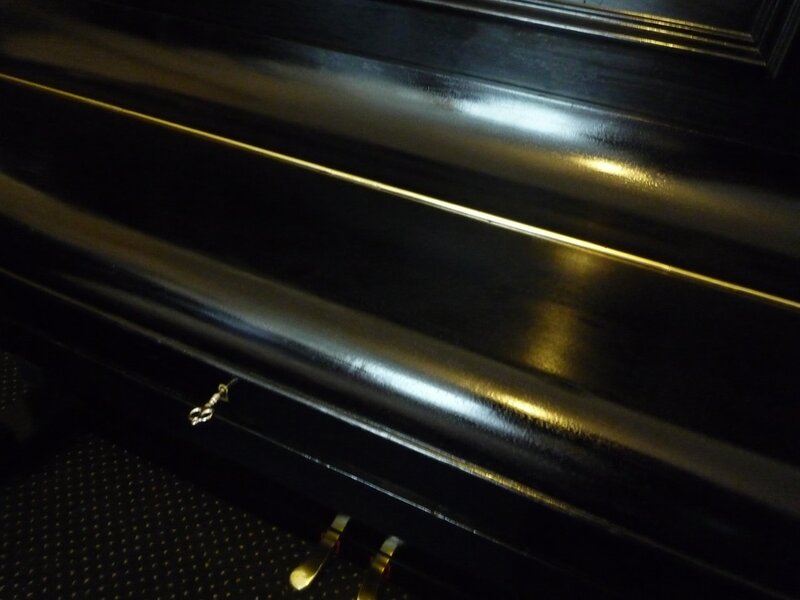 If you are opting out using a pro French polish finish, if the piano has no value / rough and ready, a quick and easy (and cheap) way to spruce up your piano is to apply blackboard/ chalkboard paint to your piano. Kids will love it! 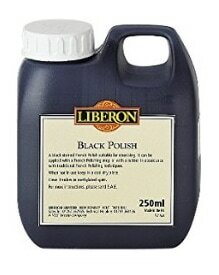 There are other products available such as Colron, but I find the best is "Liberon"
A 250ml tub of polish is sufficient to polish any upright piano. This polish is specially formulated and mixed with shellac and methylated spirits to readily apply to your piano straight from the tub - no need to mix it with anything. Pour the polish into a plastic "takeaway" container - about half fill the container. 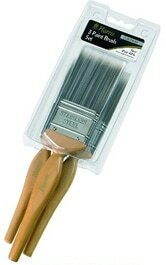 Half - soak your brush then wipe off, then apply quickly one long stroke at a time. WARNING: This polish touch- dries VERY QUICKLY, so never go over a stroke. Always work using thin strokes/ leave for 10 mins, then 2nd coat and so on. 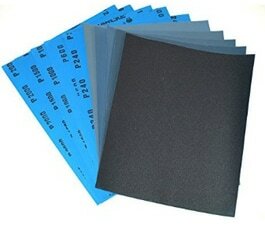 By the time you reach the other end of a panel, the first part will already be touch - dry, so work quickly. DO NOT apply this polish thickly, otherwise it may blister in certain areas. The wood must be scrupulously clean for each coat. Allow about 10 - 15 minutes between coats / apply 5 - 7 coats. TIP: When replacing the screw top lid to the polish, always clean off any excess polish around the lid inners/ threads. If your brush has gone hard, soak in Methylated spirits to dissolve. 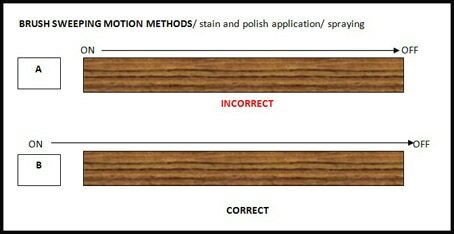 This simple diagram demonstrates how you should apply stain, polish or application of lacquer spray for brass work. 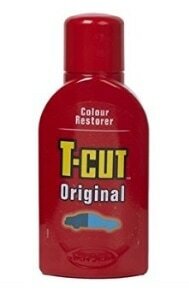 This will guarantee you have an even coat and prevent drips or build-ups. A: Never start or finish on each edge, as this may accumulate deposits on the outer edges or drips may occur. Removal of the front key rail will ensure there are no build-ups of polish near the cheeks. B: Correct procedure is to "land your brush" just before the edge, and in one continuous sweeping motion, continue after the opposite edge. TIP: If one of the edges has a build-up, it will always appear darker, no matter how many coats you apply. Work using quick continuous sweeping motions of the brush, then start to raise the brush near the opposite edge. Job done. You can always add to your work, but it is more difficult to take it away. Same applies to spraying or adding stain by cloth or brush. Left: front panel A (reverse side) marked ready for polishing. 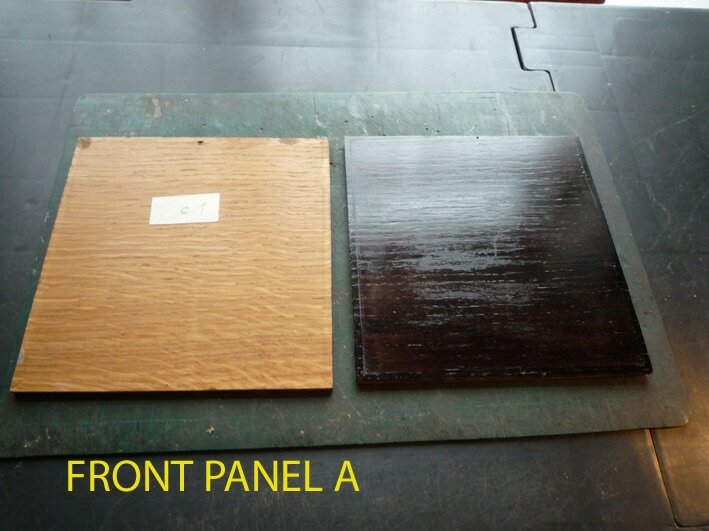 Right: First coat of black French polish - using B panel sweeping method. For the novice, practise on the reverse side of a small panel (usually not polished), then advance onto the other parts. the next coat. The finish may appear too shiny to start, don't worry, this will be dealt with later. 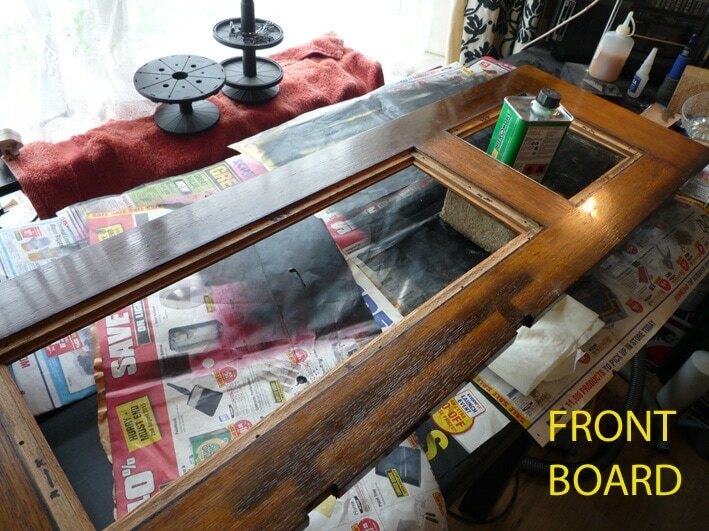 NOTE: French polish is not like normal paint.... it is much thinner, and dries VERY quickly, within seconds. If you get any drips, quickly wipe them away with a dry cloth, or when dry, sand off. 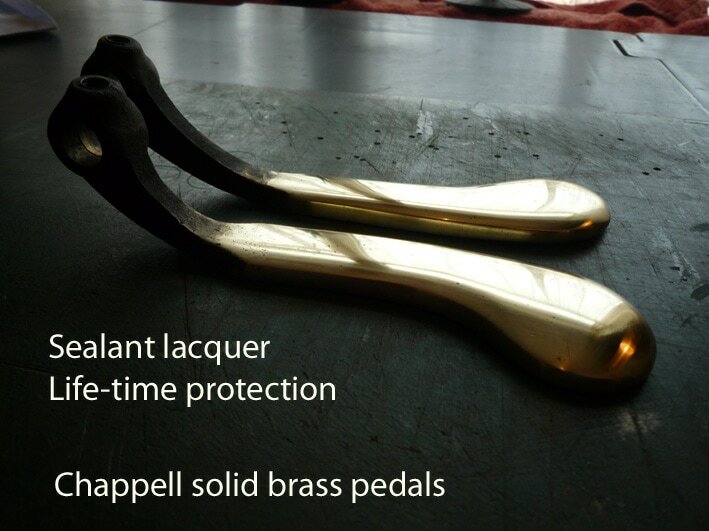 For a professional job, the pedals and felts have been removed during the polishing stages, then assembled later. The inner cabinet walls have also been polished. After each coat of polish, use tally marks. 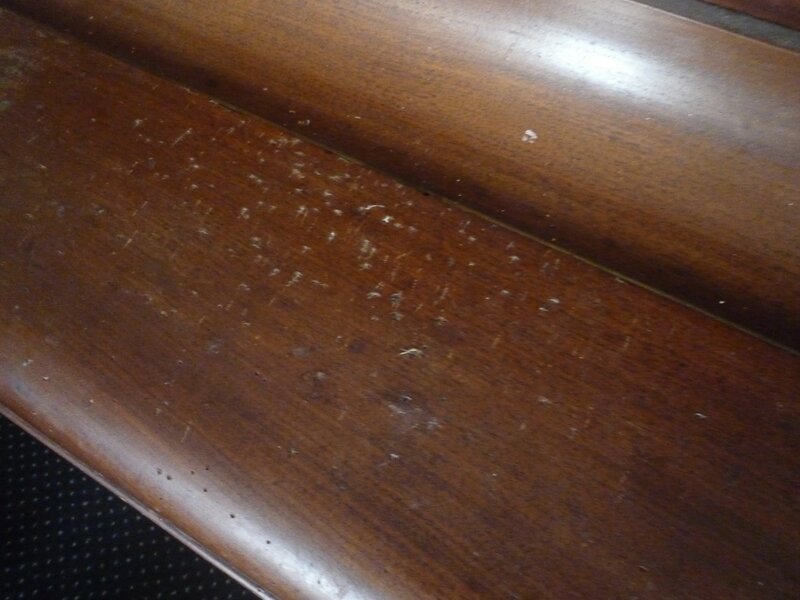 Even professional French polishers forget how many coats have been applied on pianos. Between stages, always put the lid back on the container. Wrap your brush in cling film to keep it wet. If overnight, soak brush in meths / jam jar. Before polishing things like the concertina music rest, it is recommended to mask the brass rivets with liquid maskol. This is available in model shops. Best to apply it with a cocktail stick as it goes off quickly. When the maskol turns dark purple (almost black), it is dry. After polishing, peel off the maskol. Suggestion: On this music rest, I spray painted it using model paint, using a semi-gloss black (equivalent to Tamiya X18) - gave the piano a two-tone effect and better dimension. Brasso. Remove all traces of old polish around lettering. Next, mask each letter off; then cut out each letter with a sharp knife. Apply several coats of polish, then remove the masking. If the name is a decal, either preserve it with masking tape (lo tac), or replace with a similar new decal. Showing the finished brass inlaid lettering to a rosewood backing. Including pedals, hinges, music clips, lock & strike plate etc. If the brass is dark golden colour in places (right pedal), it may still be protected by a clear lacquer all those years ago - this will need to be removed with wet & dry sand paper first. 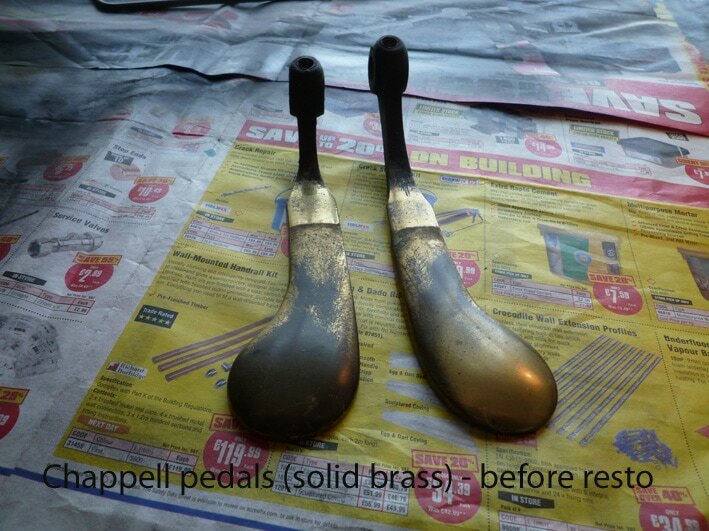 If the brass is almost black in places (see left pedal), the lacquer has rubbed off years ago, and the exposed brass has oxidised and turned black over many years. This is more common to see on the pedals. Remove all the brass fixtures from the piano. on the piano, masking surrounding areas. 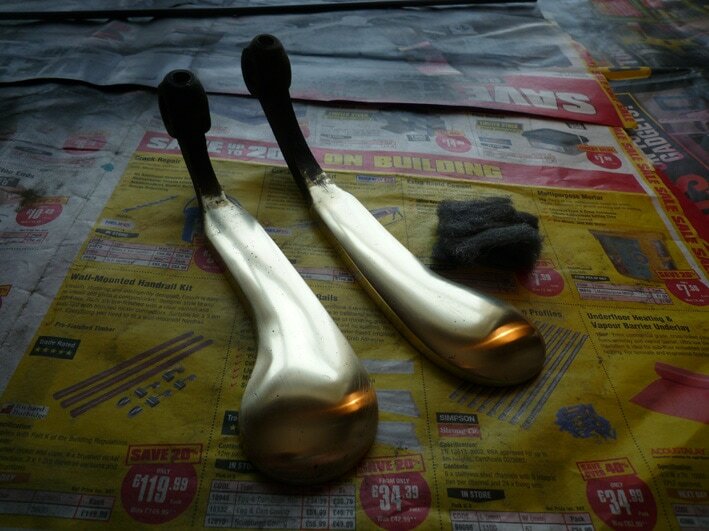 Preparing the brass for polishing is a six - stage process. marks - don't worry, this is normal. For hinges, fold them shut and sand the joins as well. Always sand lengthways, not across the brass parts. shiny, but still tiny scratches (see left). more shiny finish...... nearly there ! Apply some cutting polish to a cotton cloth, and rub liberally and hard over the brass many times. The brass will rub off black onto the cloth - replenish and polish many times so it becomes shiny and you can see your face in it. Leave to dry and buff up with a clean cotton cloth. Repeat the cutting process if needed. 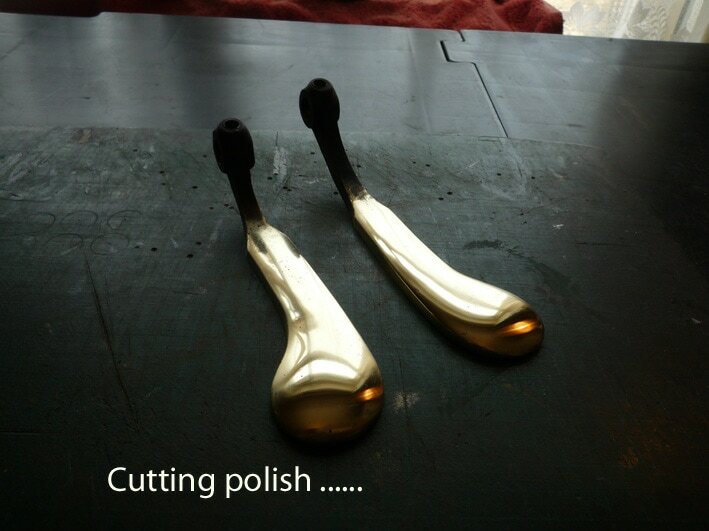 At this stage, the brass must be completely free of polish, marks and any finger prints - ready for lacquering. Some stubborn marks / deep scratches may not be able to be removed fully. Give the brass two coats of lacquer. it oxidise. Clean the brass occasionally with a dry cloth, but never use cutting polish or brass polish again. Clear lacquer is best applied when the parts (and room) are warm. If spraying onto very cold brass, the lacquer may turn white in places. 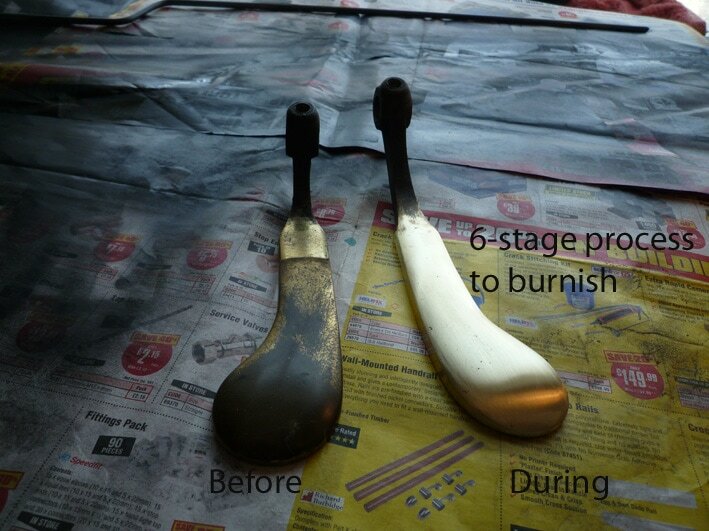 To prevent this from happening, warm up the brass first on a radiator (the brass will retain its heat) - then lacquer. It is best to lacquer in a room of about 20 degrees Celcius / well ventilated. Leave the brass for about 2-3 hours to fully dry, then re-assemble onto the piano. If the ebony polish looks too shiny, it can be toned down with 0000 gauge wire wool. Apply wire wool lightly, in the direction of the grain. 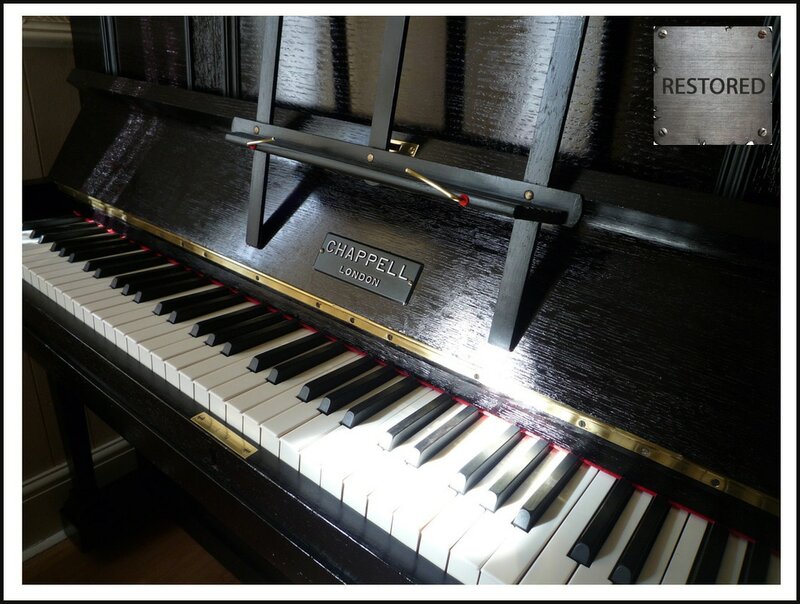 When you have finished the process, do not place any items on the piano for at least FIVE days. This includes coasters, plants, music books, ornaments.... NOTHING! The polish needs to fully harden before the final stage. This image is taken from the top of a china cabinet. If your finish is gloss, semi-gloss or matt, this final process is applied for any of those finishes. When the French polish is fully dry, apply wax polish. 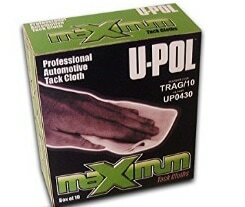 Buff up with a clean cloth. Do not use any household furniture spray or cream polishes or cutting polish again. 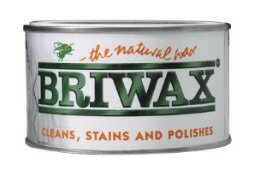 Only use wax polish for re-polishing, or a dry cloth. Whatever products you apply, from start to finish, you must use the correct/ similar "medium" content of products throughout. Certain product mediums do not mix with others, and may blister, react or even erase your work. 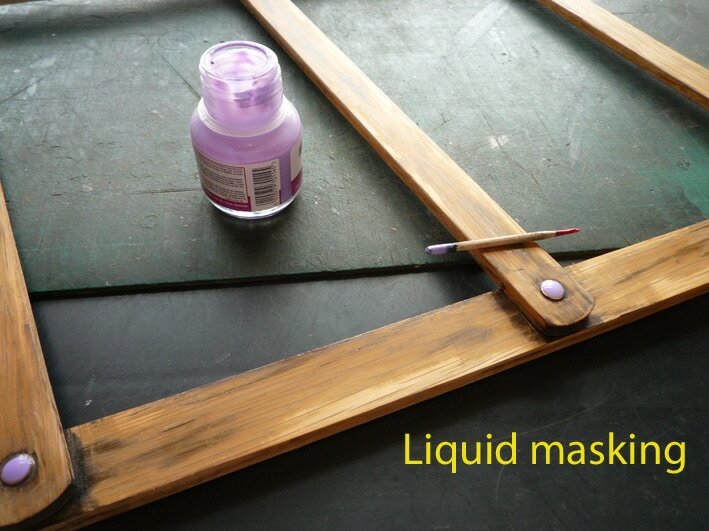 Most products are water-based and can be used with acrylic lacquer finishes or stains. If you choose to use a wood stain before polishing (intermediate stages), always check the contents, as some stains are spirit based. Acrylic and water-based mediums usually smell more neutral, like water paints. French Polish is spirit based as it contains Methylated Spirits. Use a spirit stain if required, not water-based. 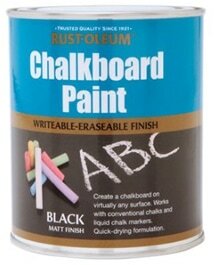 Take care using after-market (unknown) varnish brands and mixing them with "water" blackboard paint - they may not mix. 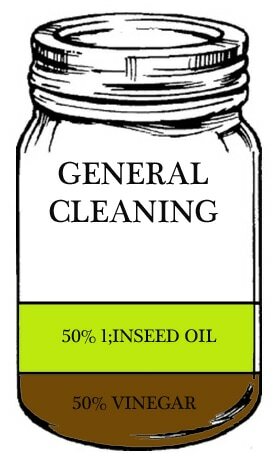 Oil-based products are Linseed Oil (used as a French Polish rubber/ general clean with vinegar) and Danish Oil. If you use any oil-based product, do not use water-based, as they may repel. TOP TIP: Check the instructions where is says "cleaning paint brushes" .... this will give you a good indication. You will be surprised how easy it is to lose track of how many coats of polish you have used on your upright piano - so here is a template chart I designed to keep track. For each coat = 1 tally mark. The average upright piano has over 30 panels, so if you apply 5 coats of polish to each one, this is around 150 tally marks. This chart mainly applies to the application of the French polish, not prep stages. 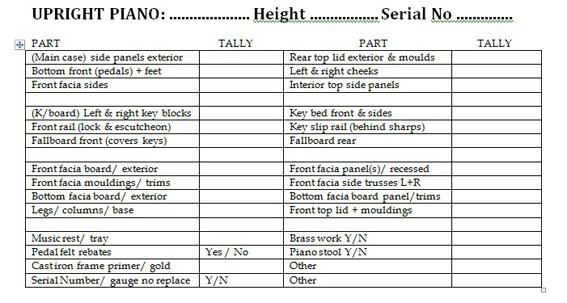 Grand pianos require a similar chart, and will require extra space for the top main and front top lids. 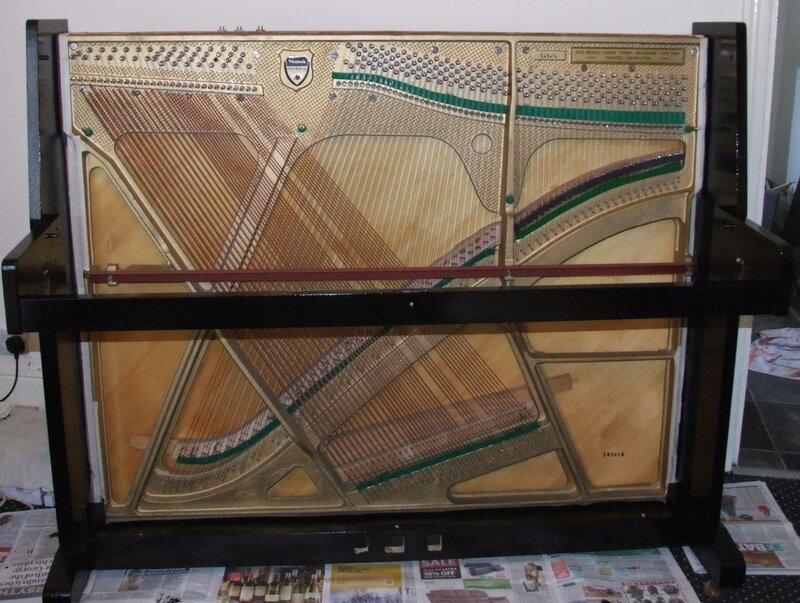 On some grand pianos, the fallboard lifts off separately and connected by gravity using a pin and "cup" hinge; on others, the fallboard hinge pins are connected and slotted in to the right and left key blocks, so you must undo and remove the key block screws first (under the piano) with the fallboard at the same time. Before lifting out the key blocks/ fallboard, the front rail must be removed first - this is often held tightly or by pressure by the key block front mountings. The front rail doesn't usually have screws, and should lift out easily located by wooden dowels. When sliding out the mechanism, do not touch any of the piano keys, otherwise you may break some hammers. The mechanism and keyboard (grand pianos) slide out as one complete unit. The preparation and polishing stages are the same for grand pianos. 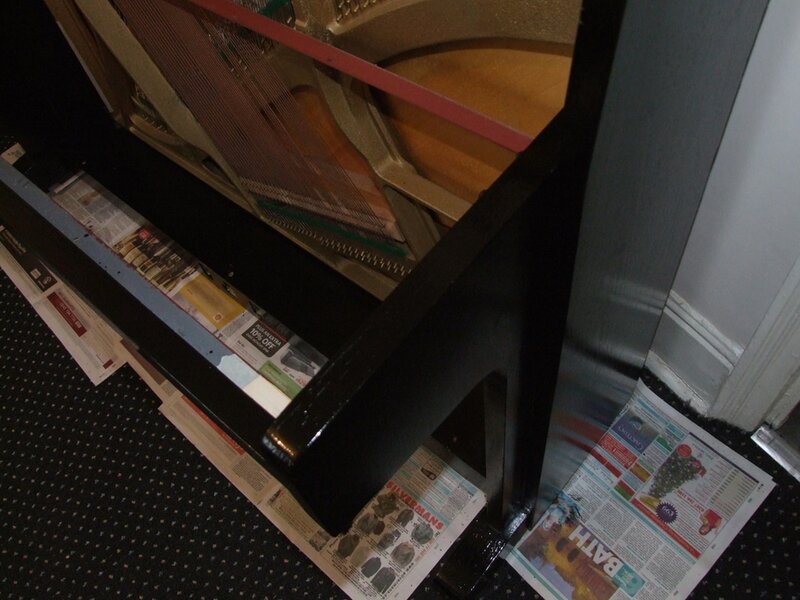 If working under the piano, always make sure the leg bolts/ cleats are secure and tight. If you need to remove each grand piano leg (castor? ), do so one at a time, but you will need to hire a grand piano raising jack. 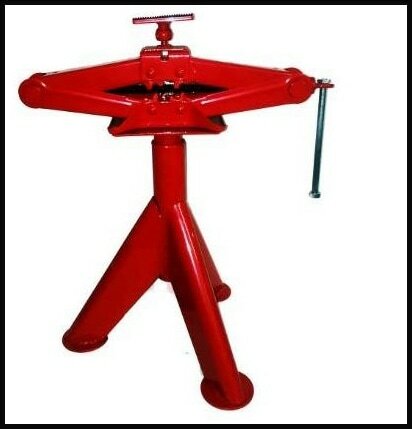 A raising jack consists of a large axle stand with a scissor jack attached to the top. The top of the jack has felt or rubber padding. 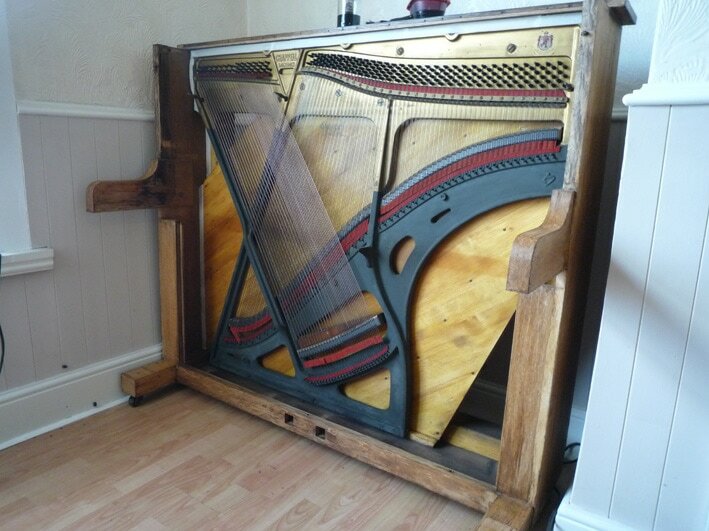 For upright piano key bed removal, you will need to hire a bench truck to tip the piano over onto its back. The inner screws for the key bed base lie deep inside the legs, so removal of the front castors is required first. Ask your local piano tuner / piano shop for assistance if required. This all-in-one jack is the only tool to lift up your grand piano "corner". The jack fits conveniently under any of the legs, and raises that leg off the ground. 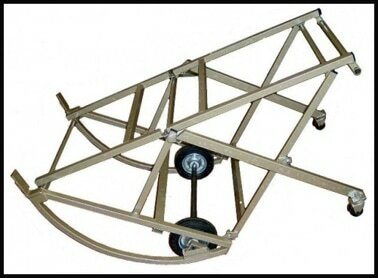 Capable of lifting 1.5 tons, so will raise any concert grand piano leg. NOTE: This jack does not lift the whole piano, only one corner/ leg at a time. 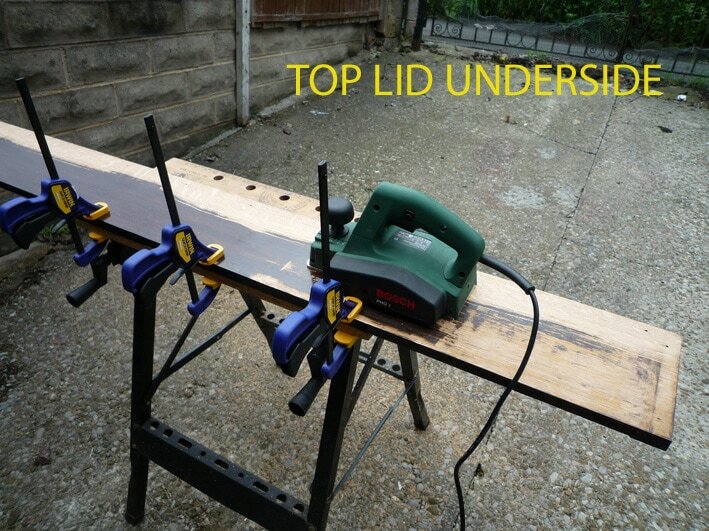 # Folds easily into a "flat pack" for storage/ car boot. Also easy for those "difficult to reach" places such as veneered legs and feet / rear of legs. For hiring or purchasing either of these products, please ask for details. If you are simply treating things like a table, chairs or other household items of furniture, some of the above may not apply to you. If a piece of wood is scratched, dented, gouged or marked, the general rule is "strip back and start again"
There are no hard and fast rules in wood repairs, and much of it is on a trial and error basis, or try another method. 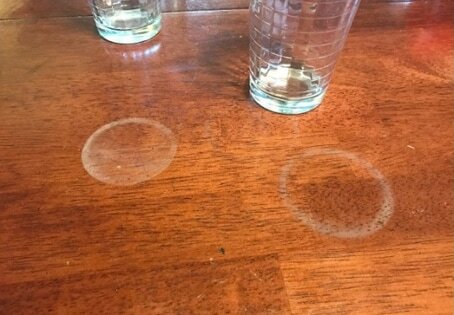 Caused by a hot drink or spillages, if the damage was recent (within 2-3 days), you may be lucky in removing the ring marks. 1. Put some meths on your finger and run it around the ring mark. 3. Immediately wipe the meths away - watch what happens ! 2. 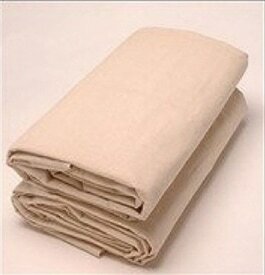 Lay a dry cotton cloth over the ring marks. 3. Gently rub the iron over the cloth, allowing steam to penetrate the cloth - about 20 - 30 seconds. If the above fails, possibly due to it being "old damage", then strip back the varnish/ finish, and start again - Prep stage 1. WHAT CAUSES THE RING TO TURN WHITE? Ring marks and white spots are caused by condensation, like a steamed up window, so what you actually see are tiny droplets of water under the polish (like a see-through window). This then mixes with the stain/ polish and turns the wood white - but it is just a layer of condensation trapped between the wood and varnish/ polish. When heat is applied, this helps to dry up the water droplets, and the white marks disappear - magic! If the wood has been damaged beyond a normal scratch or scuff mark, and looks like this (left/ before), depending on how deep the dent is will require a slightly different approach - so trial & error. Try sanding the dent first to level it out. If using Black French polish to finish, then fill in with a shellac stick (prep 2). If the wood is to remain untreated (to look as it is), then try a hot steam iron directly on the wood to "raise the grain". This often swells the wood, and dents become "thinner" - then allow to dry / sand wood. For more drastic cases - gently use a plane over the wood. If the wood finish is oak, mahogany etc., (not black), use a matching shellac stick to colour in and remove dent completely. We have been faced with may difficult situations and dilemmas in the final decision "what colour do we choose" ? This is an original mahogany (veneered) fallboard from a German upright piano - Lenz of Berlin. The final decision was to fill every hole with melted shellac, strip the wood back, and finish it using the Black Ebony polish. There ARE some tiny issues still, but hey! .... have a look yourself. I have been asked many times, "can we have a natural wood finish for our piano"? ...... and in most cases, the answer is NO. Pianos are not like your average "natural oak" dining table, as pianos are made up of several different "un-treated" woods, timbers and veneers, whereas a dining table is made from one piece of wood - left natural / not veneered, and looks great in your kitchen - diner. The finish you see on most pianos is not the natural wood colour, but a blend of stains, brown shellac and coloured finishes (and hidden nasties). The main cabinet and fallboard is usually veneered, then coloured to something like "rosewood" - but this is not real rosewood. Other sections of a piano such as the music rest, mouldings and trims and certain small parts are made from solid mahogany or maple (if bent) - not veneered - then stained and polished to match the rest of the piano. Pianos stripped and wax polished only will look patchy, and any "untreated" woods are difficult to match. Certain areas will look nice and natural, but some will not. Here is a classic example taken from the restoration of a Victorian China Cabinet. Before strip down & sanding, all the "wood" was the same colour - however, upon strip down revealed a shocking discovery.... vertical runners were mahogany; horizontal beams (curved) were maple, and this also showed up various gaps, grain sealant fillers and other "behind the scenes" materials. 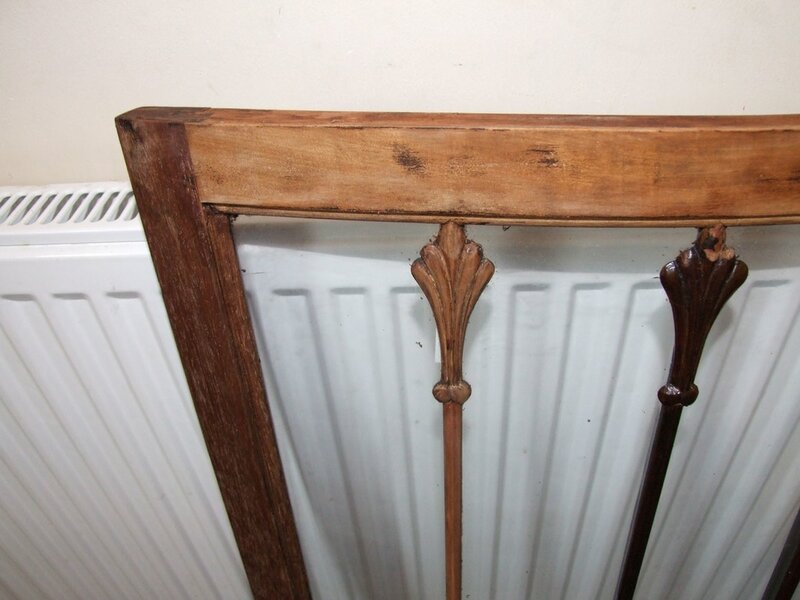 The maple beam could not be stained because this type of wood was so hard, so the French polish had to be mixed with a powder - concentrate to "colour in" the wood colour - eventually we chose rosewood, but it wasn't rosewood! Another problem I am faced with is dark shadows caused by sunlight bleaching surrounding areas. Here where the music rest hangs, behind it never sees the day of light, so this appears much darker. A much bigger problem appeared at the lower section, where the fallboard is constantly left open - again, creating a dark shadow. 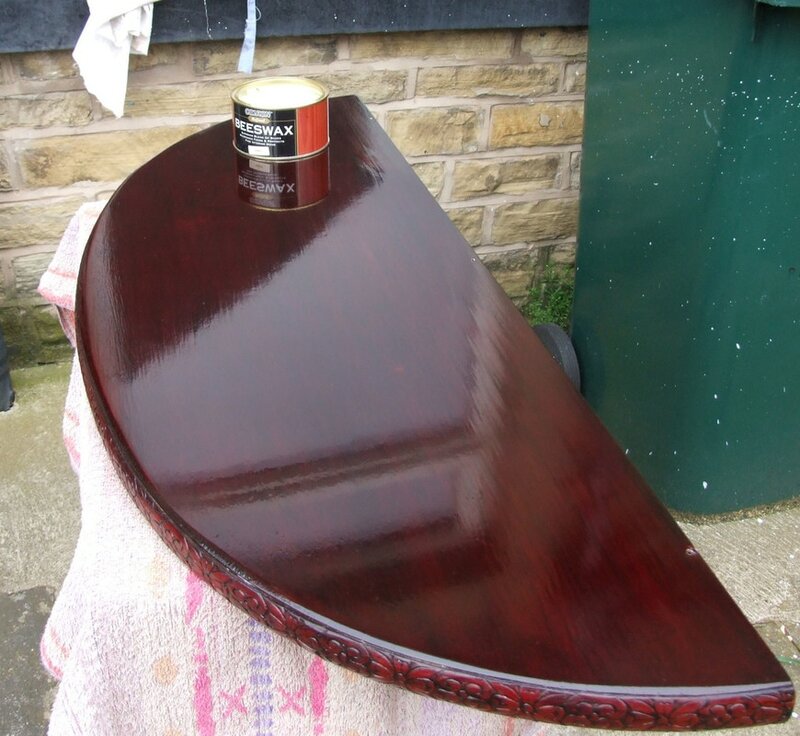 When the polish reaches this "dark shadow" stage, it is difficult to remove, and even after stripping, the lighter areas will never match exactly with wood stain, unless the wood is sanded. This would inevitably show up on any natural wood finishes, and the piano would look patchy. The piano can be stained darker than the shadows (dark oak), along with the lighter wood - but defeats the object of natural wood, and in all honesty, the best answer is Ebony Black Polish. This would then hide all sealants, joins and any scratches or dents would never be seen again. Ebony polishing still requires strip down, but some stages of finishing are not required. Remember that for us to re-polish your piano using the natural wood finish would take a lot longer than an Ebony finish, and there would be problems along the way should I hit that maple strengthening bar or solid wood parts. Piano woods are a lot different to dining tables and chairs. The inside top lid on any upright or grand piano is always constantly in the dark, from one year to another, for a period of over 100 years - and only opened for tuning. Grand piano top lids, even though they may be opened, they rarely get much light. When I applied chemical stripper to this underside of the lid, there was no reaction whatsoever, because the whole lid had become a soaked "dark shadow" - leaving no option but to completely strip the wood by using an electric plane, removing about 0.25mm of wood. This would be fine if it was a dining table, but left untreated may bend the wood in years to come, and would look patchy. The only answer = Black polish. The above information is a guide only and omits certain intermediate procedures. 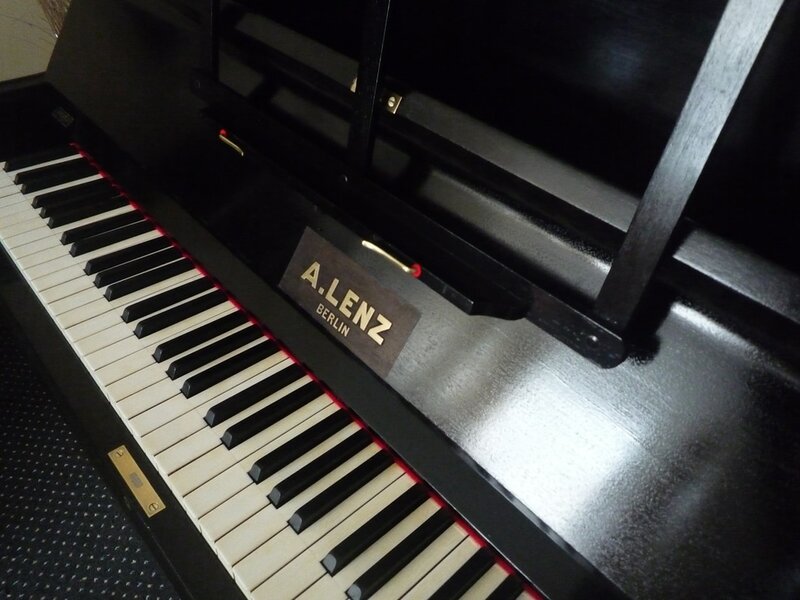 AA Piano Tuners UK is welcome to answer any questions about your piano, however, I are NOT responsible or liable should any of your procedures fail or react in your work; nor will I know what has cause it, but possibly lack of good prep work. 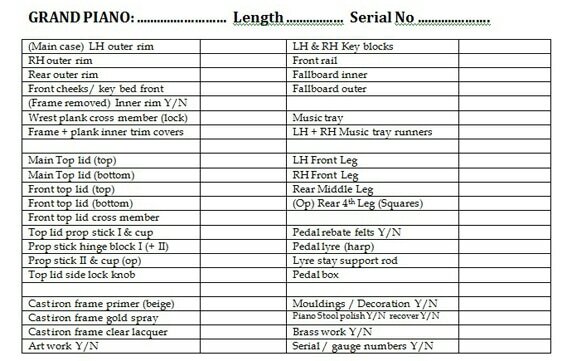 I hope this information is useful, and should you wish to display your piano on omy gallery, please get in touch. 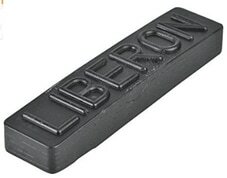 For more information / advanced polishing techniques by Liberon themselves, click on the PDF link below.